USA and North America are the same? Most countries consider North America to be all the countries North of Colombia. I know this Sunday will be a huge soccer game at University of Phoenix Stadium between Mexico vs Uruguay. I know Canada is not part of the US, but USA, Canada and Mexico are consider North America and anything south of Mexico is considered Central America. I'm watching USA v Argentina. USA is trailing 4 zip, but I think they can still win. There are 12 minutes left I think. It's all in Spanish. I get the feeling the Women's US team could easily beat the Men. Klinsmann needs to be fired. Have Landon Donovan be the coach or something. Imho, the men's team, as a whole, is nowhere near as talented at the European or South American teams. Those guys learn to play football before they learn to put on shoes. It's gonna take decades before we'll ever be able to compete with those guys. But how many more decades will I hear Americans say that? How many decades do you have? Since the World Cup in 1994, we've gotten better. The local minor league soccer team in Phoenix is rebranding themselves again. 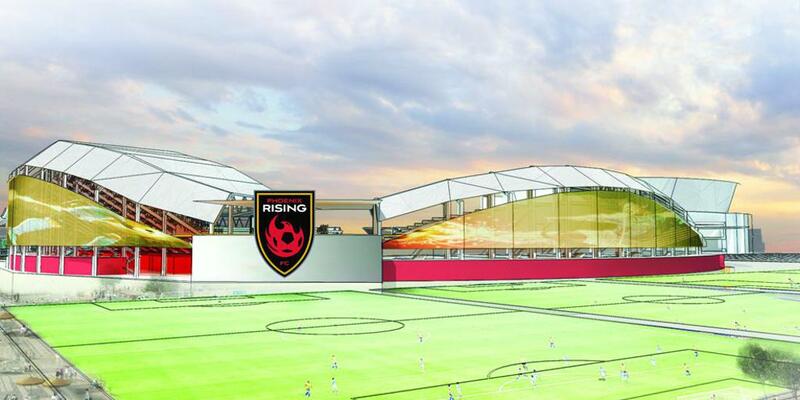 The team was found in 2013 as Phoenix Wolves FC and try to fold, then somebody bought the team in 2014 rebranded as Arizona United FC and moved to multiple locations throughout the valley and then until now they are officially called Phoenix Rising FC and have a permeant home. 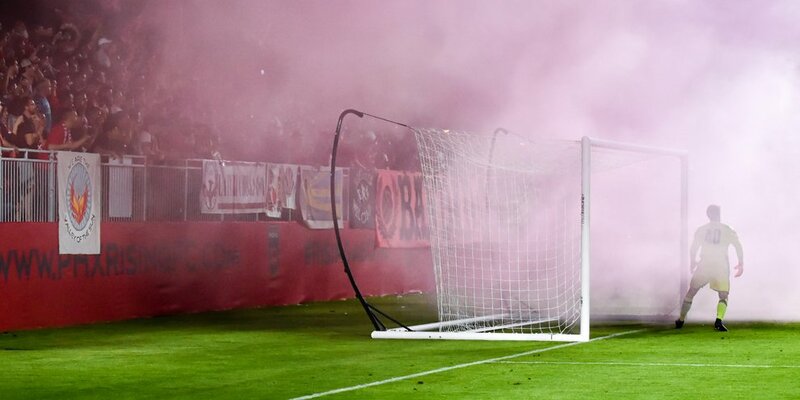 The home opener of the new Phoenix Rising FC was over the weekend, they lost 0-1 to Toronto FC II and the temporary stadium holds 6,200 fans, for the first game they set a record attendance. Then again, the weather was great over the weekend and wait till Phoenix gets into the 100's and the attendance will probably drop. I didn't attend the game, but I was watching the game off and on, on youtube and the fans were going crazy and I don't understand the smoke thing. The United Soccer League (USL), the recently upgraded second-tier of North American soccer, has expanded its media reach for the 2017 season. Under a renewal with ESPN, an increased slate of USL games will be shown across ESPNU, the broadcaster’s outlet for college sports and other programming, and the streaming service ESPN3. This coming July, two fixtures will be shown on ESPNU - the Tampa Bay Rowdies versus FC Cincinnati and San Antonio FC versus OKC Energy FC - as well as November’s USL Cup. ESPN3 will also continue air the USL Game of the Week, while ESPN FC, ESPN’s online source for soccer news, will provide league features and information. ESPN enters its second season as a USL broadcast partner having televised last October’s USL Cup final. All games will be produced by USL Productions, the league’s US$10 million broadcast unit based in south Florida, and also made available via the USL Match Center. Meanwhile, SiriusXM has also agreed to provide live radio coverage of one game per week and a weekly one-hour show each Monday throughout the season. Like ESPN, SiriusXM is expanding its USL coverage this year having transmitted October’s final. The 30-team USL, headquartered in Tampa, Florida, has more than doubled in size since 2014. In January, the US Soccer Federation upgraded the league to division two status, putting it alongside the North American Soccer League (NASL) and one level below Major League Soccer (MLS).